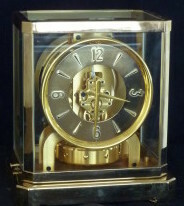 Chelsea Banjo Clock 33″ high. Beautiful hand painted glass picture of Mt. Vernon, George Washington’s home in Virginia at bottom. Clock has no pendulum in spite of its length; timing is controlled by an escape platform with hairspring, balance wheel, verge, and escape wheel. Clock strikes on the half hour and strikes out the hours. Brass finial with brass scrolling down both sides and brass bezel. Crystal is convex. 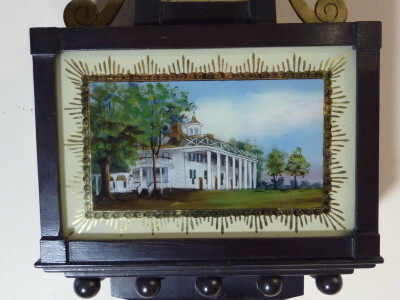 Clock case and face made by George W. Welsh’s Sons, New York which is printed on dial.